Almond, coconut, rice, flax, and hemp milk are all terrific lactose-free milk substitutions that make delicious smoothies. Any flavor of yogurt can be spooned into the blender—there are no rules. Spoon the yogurt and milk into the blender container first, so that the blades will start rotating quickly rather than getting hung up on the hard, frozen fruit. Strawberry-banana is one of the most popular fruit combos for smoothies, but if you find yourself with an overload of other ripe fresh fruit, get to work creating your own freezer pantry. To freeze fruits, sort, wash, and drain completely on a clean kitchen towel. Prep fruits as you would for serving by removing stems, coring, peeling, and slicing. Small whole fruits such as berries and cherries (pit them first) can be frozen individually, then placed in ridged covered containers or freezer bags. Freeze ripe bananas, in halves, so they’re ready and waiting too. With just four simple ingredients and a quick spin in the blender, you can have a fruit-packed, protein-rich smoothie in just five minutes. The thick texture and tang of Greek yogurt is a perfect complement to the sweet, tasty fruit, and making it at home gives you a jump start to a streamlined, better-for-you day. Once you know how to make smoothies with this basic recipe, you can switch it up with ingredients like mango, pineapple and coconut, or whatever ingredients and mix-ins you have on hand. 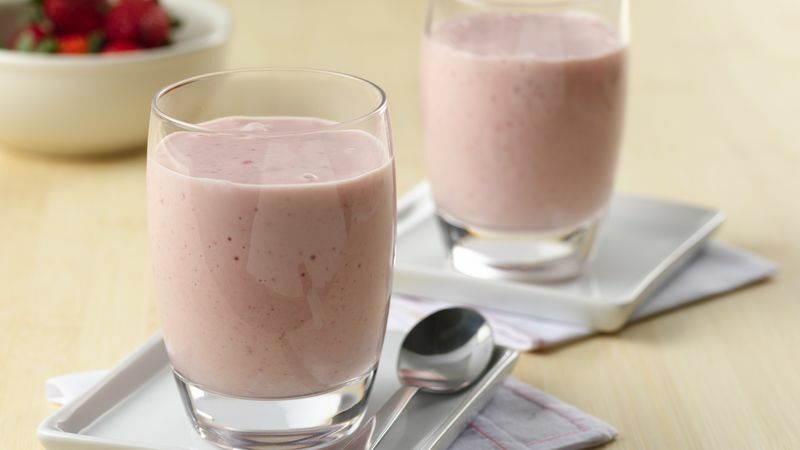 Now that you’ve mastered this strawberry banana smoothie recipe, you can make smoothies a regular part of your routine. We’ve also got some handy tips for making smoothies even easier with make-ahead versions. For new ideas and inspiration, check out the rest of Betty’s best smoothie recipes.